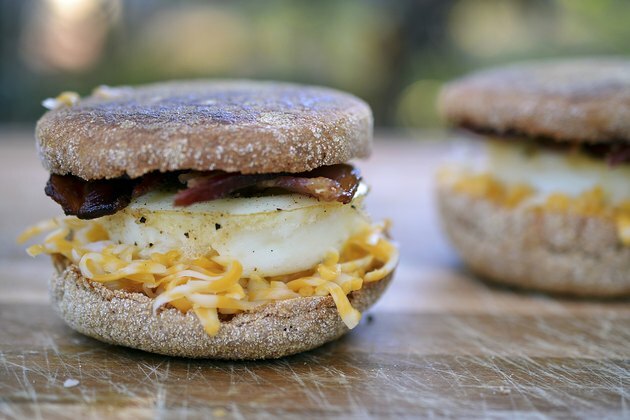 A McDonald’s Sausage McMuffin with Egg breakfast sandwich is relatively high in calories. The sandwich consists of a sausage patty, fried egg and American cheese served on an English muffin. The egg is prepared with liquid margarine. A Sausage McMuffin with Egg is relatively high in fat, sodium and cholesterol. A McDonald’s Sausage McMuffin with Egg contains 450 calories, according to the nutrition information provided by the McDonald’s website. Each sandwich weighs about 8 oz., or 162 g.
Of the 450 total calories in a McDonald’s Sausage Egg McMuffin, 250 come from fat. To help keep your cholesterol levels down, the National Institutes of Health recommends that you not consume more than 30 percent of your total daily caloric intake from fat. That amounts to about 66 g of fat per day for most adults. The fat content of a Sausage McMuffin with Egg is 27 g, 10 of which are saturated fat. In addition to its high fat content, a McDonald’s Sausage McMuffin with Egg contains 285 mg of cholesterol. The National Institutes of Health recommends that your total daily consumption of cholesterol not exceed 300 mg. If you enjoy a Sausage McMuffin with Egg for breakfast, that means you can only consume 15 mg of cholesterol in the rest of the day if you stay within the recommended guidelines. One McDonald’s Sausage McMuffin with Egg contains 920 mg of sodium, 30 g of carbohydrates, 2 g of dietary fiber and 21 g of protein. A plain McDonald's Egg McMuffin contains 300 calories, a Sausage McMuffin has 370 and a regular Bacon, Egg and Cheese Biscuit contains 420. A regular Sausage Biscuit with Egg contains 510 calories, and a large Sausage Biscuit has 480.